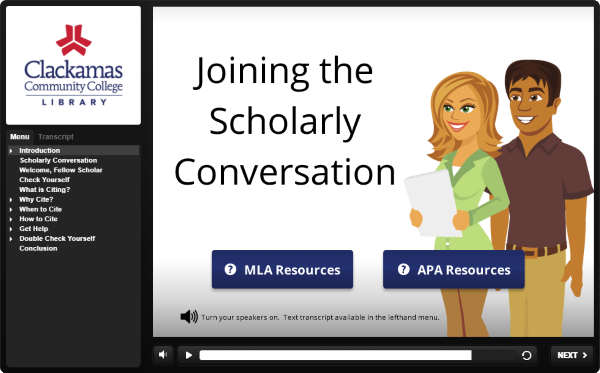 Learn how to format papers, cite information sources using MLA and APA style, and how to avoid plagiarism. Plagiarism is presenting someone else’s work as your own. While plagiarism isn’t against the law, it is a form of academic dishonesty and will result in disciplinary action. Learn about the consequences of plagiarism in the CCC Student Handbook (155). 2017-2018 Clackamas Community College Student Handbook. Learn how to avoid plagiarism by correctly summarizing, paraphrasing, and quoting sources. Joining the Scholarly Conversation opens in Moodle, in a new window. Log in with your myClackamas credentials and begin the tutorial. Turn up your speakers, or access a transcript in the lefthand video player menu. Tutorial last updated by CCC Library (Oct. 2017). Except where otherwise noted, content in these research guides is licensed under a Creative Commons Attribution 4.0 International License.